Frontispiece portrait of Charles I, from Eikon Basilike (1649). The mid seventeenth-century was a time of great social and cultural turmoil. A series of political and military conflicts, now known as the English Civil War or the English Revolution, was waged intermittently between Parliamentarians and Royalists from 1642 to 1651. There were many factors contributing to the tensions between the Crown and Parliament, including Charles' marriage to the Catholic princess, Henrietta-Maria of France, and his desire to be involved in European wars. But the most interesting were the ideological questions being raised about the nature of government and authority. In the seventeenth century, the Crown played a much greater role in the running of the country than it does today. Parliament's power was growing, but before the Civil War, it was called and dissolved at the will of the monarch, and used mostly to issue taxes when the king needed money. Charles I believed in the 'divine right of kings' and ruled fairly autonomously, but much of Parliament believed that the king had a contractual obligation to the people to rule without tyranny. Parliamentarians were angry that Charles refused to call a Parliament for most of the 1630s, during which time he tried to levy what were considered to be illegal taxes. With Archbishop Laud, he tried to take the Church in the direction of High Anglicanism, which aroused suspicion that he was trying to revert the country to Catholicism. In 1649, after years of various political manoeuvres and bouts of fighting, King Charles I was executed for treason. For the next decade England had no monarch. Initially, a Commonwealth was formed and England was ruled by a republican government, but in 1653 Oliver Cromwell became Lord Protector, essentially a military dictator. He was succeeded by his son Richard in 1658, but because of faction fighting and Richard's lack of popularity as a leader, the republic failed. Charles II, the executed monarch's son, was declared King in the Restoration of 1660. TIMELINE: Click image to Zoom. 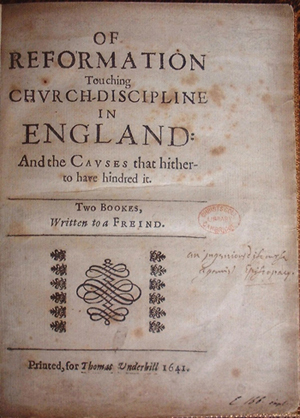 In 1641 Milton published Of Reformation Touching Church-Discipline in England, marking the beginning of a career of political prose writing which would last almost until his death in 1674. Close analysis reveals a subtle change in his thought away from the youthful orthodoxy which had led him to consider ordination as a priest, and towards the increasingly heretical and subversive theology which typifies his later writings. However, the general thrust of his political writings is towards Puritan reformation in the church, and the replacement of the monarchy with a free commonwealth. His enduring support for Cromwell resulted in his appointment in 1649 as Secretary for Foreign Languages, a position which involved acting as the voice of the English revolution to the world at large. He remained stalwart in his belief in the republic, publishing The Readie and Easie Way to Establish a Free Commonwealth only a few months before Charles II's return in May 1660. John Milton, Of Reformation (1641), title page. 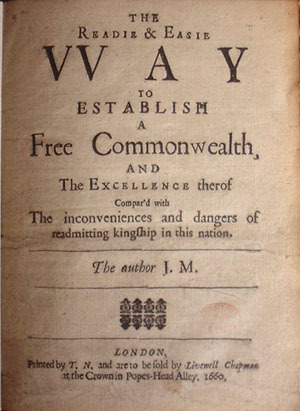 Free Commonwealth (1660), title page. Milton's thought always appears highly integrated, and his political views cannot easily be separated either from his religious beliefs or from his poetry. An understanding of the politics of Paradise Lost must therefore be informed by an awareness of Milton's political life, his work as a prose writer, and the subversive elements of his theology. 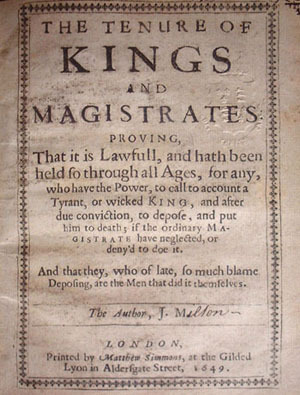 John Milton, The Tenure of Kings and Magistrates (1649), title page. Milton's argument is sublimely clever. He contends that for the king to make himself answerable only to God is to make himself a god, heretically contradicting the divine ordering of creation. However, whilst Milton's argument contains a cunning blend of biblical exegesis and political pragmatism, his influence from classical sources is clear. His definition of a monarch is rather incongruously drawn from Aristotle, and his repeated emphasis on the idea of tyranny evokes both Greek political thought and Latin writers such as Plutarch and Tacitus. The Tenure of Kings and Magistrates thus serves as a useful microcosm for broader aspects of Milton's politics: the blend of politics and religion, the importance of textual learning in his thought, and the unification of biblical and classical references, which would come to its fullest expression in Paradise Lost. It is important to recognise that just as Milton's political writings attain an extraordinary forcefulness through the use of literary devices, his poetry often overflows with political fervour and antagonism. Writing in Areopagitica, a tract denouncing restrictive censorship, Milton famously describes 'a noble and puissant nation rousing herself like a strong man after sleep, and shaking her invincible locks'; he goes on: 'methinks I see her as an eagle mewing her mighty youth, and kindling her undazzled eyes at the full midday beam' (CPW, II.558). The imagery is poetic, and the tone is elevated. The reverse effect can be found in many passages of Milton's poetry. In the penultimate speech of Samson Agonistes, Samson (before leaving to massacre the Philistines by pulling their temple down on their heads) argues: 'Masters' commands come with a power resistless | To such as owe them absolute subjection' (1404). In his consideration of divine authority, Samson seems to adopt the tone (and even the arguments) of Milton's early political writings. Both Samson contemplating mass murder and Milton attempting to justify regicide seem to fall into the same state of mind, and to share a common means of expression. In attempting to situate Paradise Lost in its political context we face a particular critical choice, which rests upon the kind of context which we have in mind. On the one hand, we can examine the stylistic and argumentative similarities between sections of Paradise Lost and Milton's more explicitly political writings. On the other hand, Paradise Lost can be read as a political allegory, which is to say that events and characters in Paradise Lost can be aligned with aspects of the political context of the poem's creation. Satan's speeches provide the strongest example of a distinctively political voice appearing in the poem. When he addresses the fallen angels Milton draws on rhetorical techniques which are well-established in his political prose. Satan deliberately misunderstands Eve in order to make God's restriction appear more authoritarian and perverse. But more than this, he implies that there is a contradiction between Adam and Eve having been created as lords over the world and their being restricted from eating the sacred fruit. The implication is gentle, and avoids direct criticism of God, instead putting pressure on Eve to justify God's prohibition. These examples also demonstrate Satan's ability to modulate between different kinds of rhetorical questioning, much as Milton's prose works combine both blistering interrogation, and the barbed, faux-naive attitude which Satan adopts towards Eve. But the stylistic similarities between passages of Paradise Lost and Milton's political works are not mere chance. They arise in part because the characters in Paradise Lost find themselves in situations which genuinely are political. In directing the Son to create earth, God the Father is conducting an act of rulership, which is inescapably political. Likewise, Satan's attempts to rouse the fallen angels in Book I really are reminiscent of Milton's desire to rally support for the Cromwellian government. These broader political parallels lead us towards a more allegorical interpretation of the poem as a whole. We can begin to see how the great debate in Book II might be read as a political satire, mocking the tiresome debates which Milton conducted in his youth. Similarly, the interaction of Adam and Eve is a fascinating study of gender politics, whilst the relationship between God the Father and God the Son presents an obvious ideal of kingship and the delegation of power. But the danger of such readings is that they quickly lose their specificity. The figure of Satan especially accommodates a wide variety of different allegorical interpretations. He can be seen as a false leader to the fallen angels, his enforcement of his own will on the great debate in Book II recalling Charles I's willful disregard for parliament. But alternatively, he can be seen to represent something of Milton and Cromwell in their revolutionary struggles against the king. At a slightly more general level he can even be seen to represent the failure of any political discourse in this period, and of religious culture which attempts to exist apart from divine authority and biblical revelation. The problem is that Satan is primarily identified as a force of rebellion against God, and Paradise Lost rarely seems to require us to construe him as anything else. 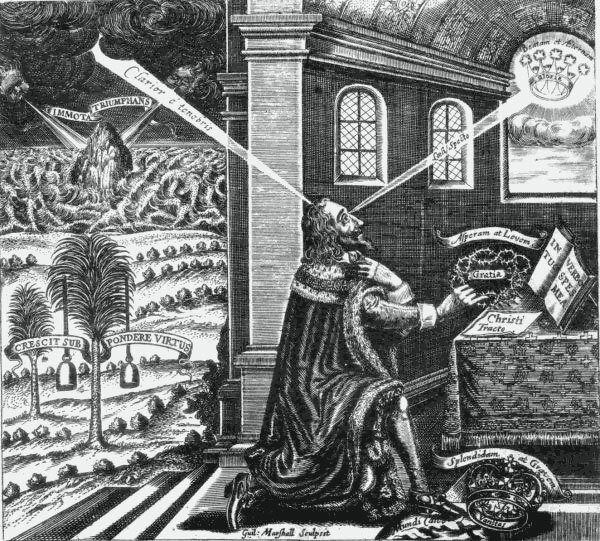 An understanding of the politics of Paradise Lost clearly depends on an understanding of the politics of the English Civil War and particularly of Milton's position in it. The application of this knowledge to the text of Paradise Lost is perhaps most effectively conducted through an appreciation of the interplay of ideas between Milton's poetic and political writings. Allegorical interpretations, although interesting and to some extent the natural result of a stylistic analysis of the poem's politics, must be carefully qualified. Although Paradise Lost is very much a poem of its times, it is important to remember that its setting is metaphysical and its direct concern religious. Stephen M. Fallon, Milton among the Philosophers: Poetry and Materialism in Seventeenth-Century England (Ithaca, NY: Cornell University Press, 1991). This is a useful book dealing with Milton's intellectual historical context. It covers Descartes and Hobbes in especially good detail, but also reflects interestingly on the nature of fictive writing and allegory in such contexts. William J. Grace, Ideas in Milton (London; Notre Dame: University of Notre Dame Press, 1968). This book gives a very clear summary of Milton's humanist, theological and religious background, and breaks the topics down into very manageable chunks. It makes a very good reference tool, and gives some quite original readings of Samson Agonistes and Lycidas. Stevie Davies, Images of Kingship in Paradise Lost: Milton's Politics and Christian Liberty, (Missouri: University of Missouri Press, 1983). Although this book probably does too little to get beyond the dichotomy of Christian freewill and oppressive institutional power structures it does give a clear idea of the different notions of kingship with which Paradise Lost engages. This is probably best used simply to dip into. Barry Coward, The Stuart Age: England 1603-1714, 2nd edition (London: Longman, 1994). Although quite dense, this book puts forward a clear account of the history of the seventeenth century, including chapters on the Civil War and Restoration which can be read in isolation. Its approach is excellent as Coward does not try to separate political, religious, social, economical or intellectual strands, but instead looks at the whole picture.